You guys will remember my enthusiasm for cancer survivor and ace musher DeeDee Jonrowe, who I met when she spoke at an Aperio sales event in February. I followed her performance in the recent Iditarod with great interest; she finished 12th, after competing for a spot in the top ten most of the race*. Well guess what? Aperio is sponsoring DeeDee! How cool is that? As a digital pathology company we don't do many corporate sponsorships, but the combination of DeeDee's cancer survivorship, her subsequent advocacy for cancer care and research (with a special emphasis on medical care for remote areas like Western Alaska), her successful efforts to raise money for a cancer center, her amazing sledding career (29 Iditarods, including 12.5 top ten finishes*), and her general positive attitude and sense of being combine to make her a perfect partner for us. Tonight DeeDee addressed our Leadership team at an offsite event, and she was most interesting and inspiring. 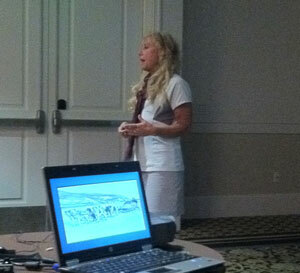 A key aspect of her talk was the leadership of a musher with her dog team, and the leadership of the lead dogs. It will be great being part of her team for the 2012 Itidarod - stay tuned! * Tonight we learned the true story; DeeDee was running 8th when she reached the White Mountain checkpoint, within range of 7th, but all her dog food was stolen! It seems amazing that such a thing could happen in such a major league race, but it did. She had to race that last 75 miles to Nome with a team that was hungry as well as tired, and she ended up dropping 4 places to finish 12th. Incredible.